Room setup and equipment have a HUGE impact on the success of the program. Done right and your audience will feel the energy of the presentation, laugh, and learn. Prefere the “front” of the room be on the long wall so the audience is sitting “landscape.” This allows closeness and also the participants can easier see each other. The distance from the speaker to the audience should be no more than 10 to 12 feet. 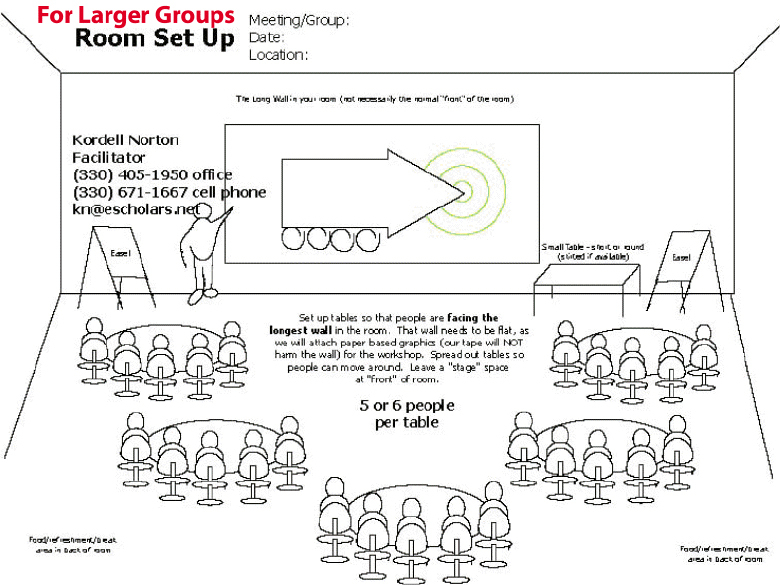 Would prefer the audience sit “Chevron” (a “V” shape) regardless of classroom, rounds, banquets, or theater seating. When one side starts to laugh the other side will also see/hear and “get into it”. 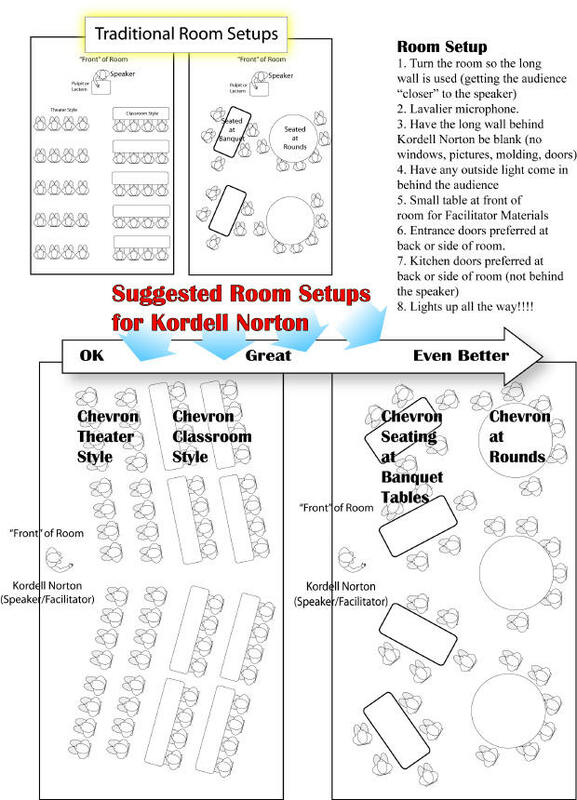 Note, Kordell moves around a lot. If the group is smaller, he can also use large group graphics and so a flat wall behind Kordell is something to be discussed. 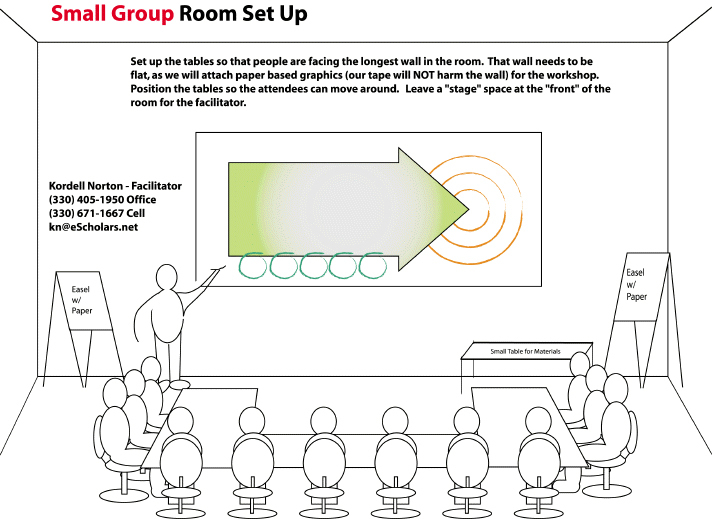 Kordell’s “artist” methods can then replace a PowerPoint/LCD projector presentation. Note: If you are using magnification and/or videotaping, plus use as much light as possible. We request a copy of any and all video/audio. America’s Charisma Consultant*, since 2001, Kordell has worked with clients like L’Oreal, Mars, PNC Banks, University Hospitals, the Social Security Administration, as well as association, government, education and corporate clients internationally. Whether it is for sales training, customer service, or strategic planning & leadership, his message is about engaging your customer in a deep, profound way . . . with charisma. 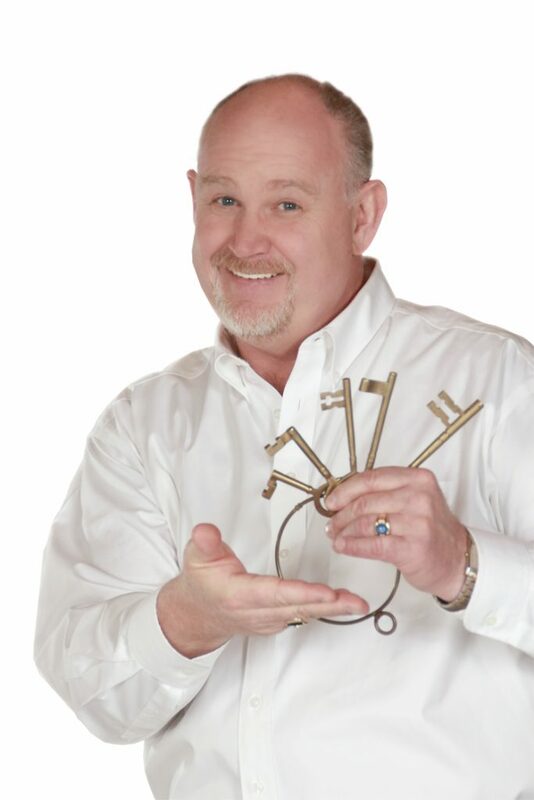 His entertaining and humorous presentations are packed with insights on how to grow any organization. 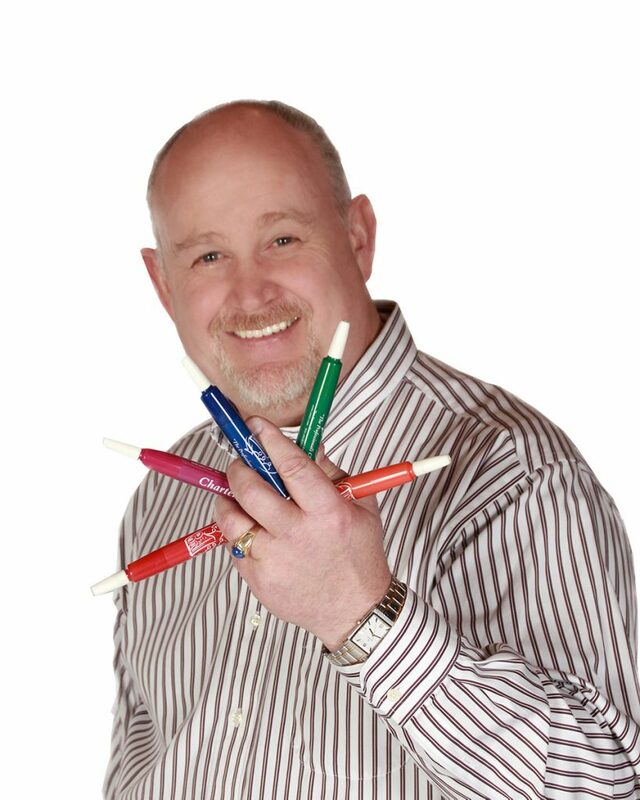 His highly interactive style is motivational for any audience or group. 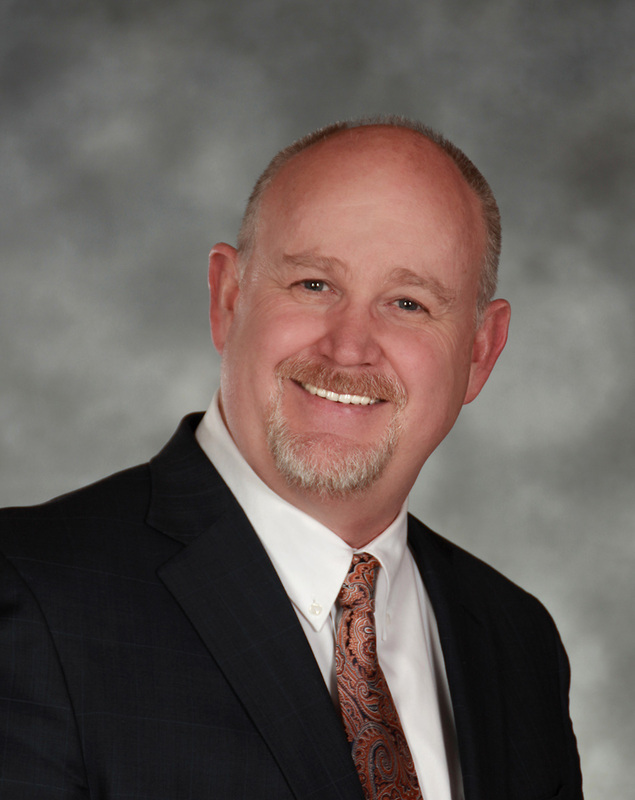 A Certified Speaking Professional (CSP) member of the National Speakers Association, he is the past President of the Ohio Chapter, and is currently on the Board of the Mountain West Chapter. He is also a member of the Customer Experience Professionals Association. 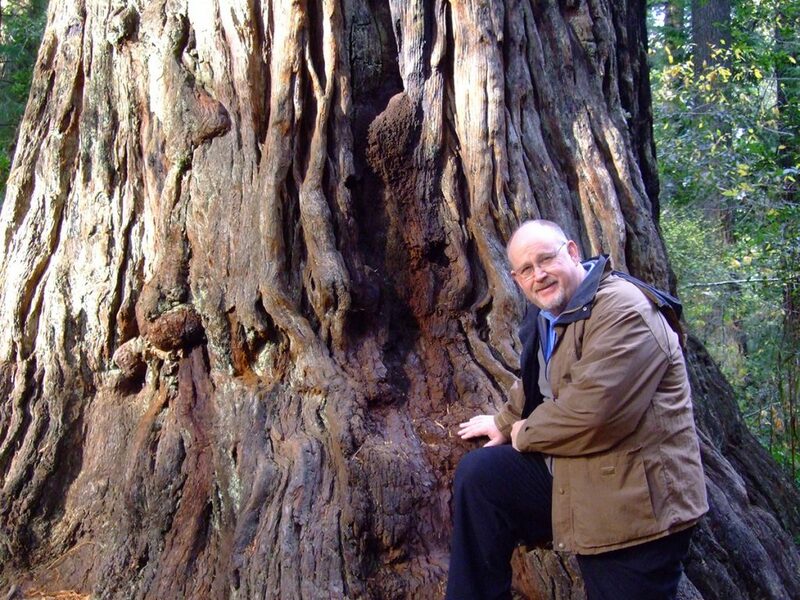 The author of 6 books, he has been adjunct faculty to more than 15 universities. 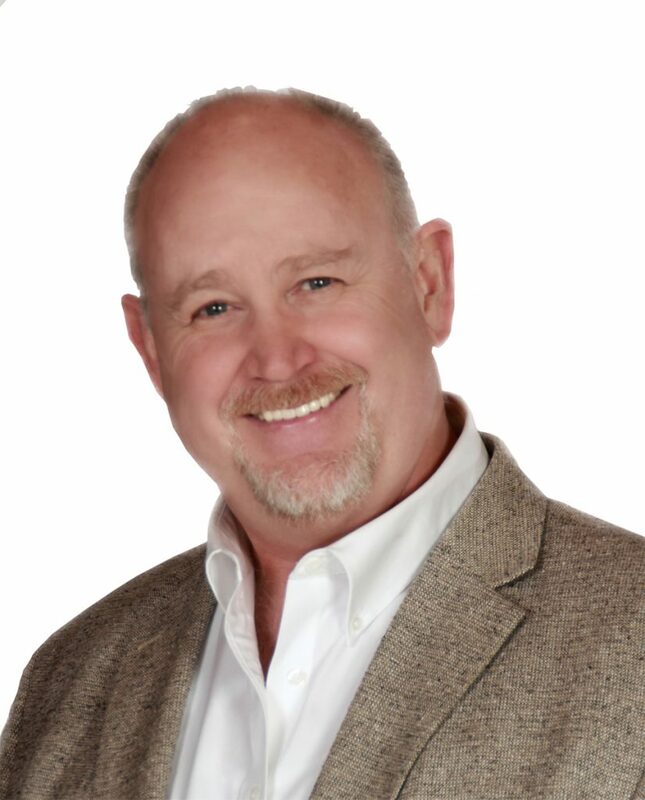 He is a contributor to publications like U.S. News and World Report, Retail Leader Magazine, Travel & Hospitality International, American Chamber of Commerce Executives Magazine, Speaker Magazine, and various trade and industry magazines. Managed a $31 million dollar marketing budget promoting little names like IBM, Hewlett Packard, Microsoft, Apple and others . . . driving $2.5 Billion in revenue. Norton was voted “Favorite Speakers” by Meetings & Conventions in 2015. Today you need skills that go beyond the Satisfied Customer . . . beyond the Customer Experience and customer “Wow.” You can steal the secrets of Disney, Apple, Trader Joe’s, Harley-Davidson on how you, and your business, can be charismatic. 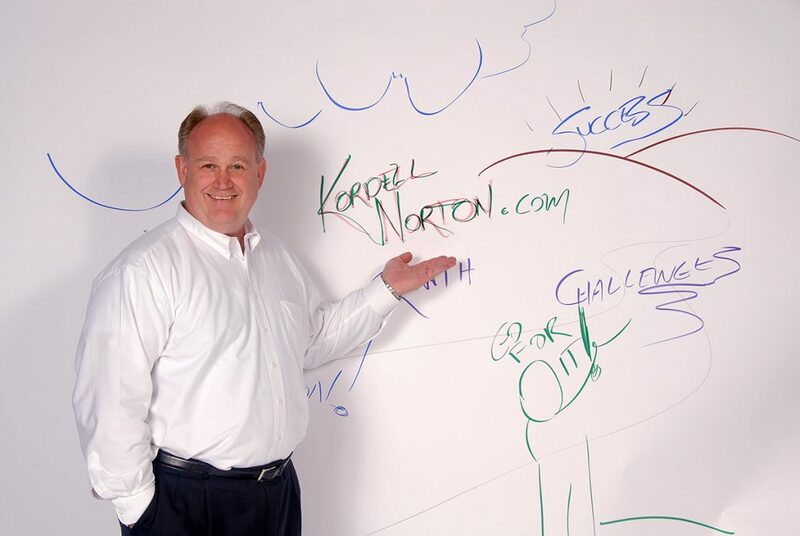 Kordell Norton is a Certified Speaking Professional member of the National Speakers Association, he has written 7 books and is an adjunct faculty to 17 universities. Recently you may have seen him in U.S. News & World Report, Retail Leader Magazine, Travel & Leisure International, and other trade and industry publications. Voted to the “Favorite Speakers” list by Meetings & Conventions Magazine.